CHILDHOOD sweethearts Stephen and Becky Mussett have told how the strain of bringing up their disabled daughter drove them to divorce. But, in an incredible twist, the couple fell back in love – and married again ! 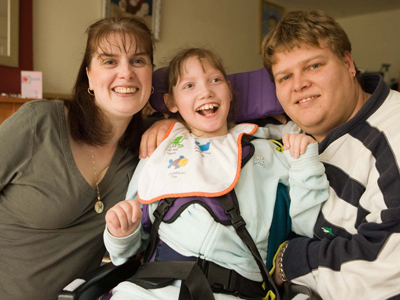 Stephen and Becky’s first marriage was wrecked by the stresses of having to look after Georgia who, they claim, suffered brain damage as a result of negligence by staff at the Queen Elizabeth Hospital, in Gateshead. With few friends or family to help them, the young couple had to cope with a baby who cried nearly 24 hours a day because of the pain she was suffering. Becky said: “Georgia has split us up and brought us back together. “We’ve been through hell. It’s been a nightmare – an absolute nightmare. “But I think we have a stronger relationship because of everything we’ve been through.” And the couple are going to need all the strength as they embark on a legal battle to win up to £5 million damages for Georgia, who has a life expectancy of just 31. Georgia, who is now nine, is unable to walk, talk or feed or wash herself. Together again…Becky, Georgia and Stephen. Stephen and Becky took their case to a solicitor when Georgia was a baby but their legal aid funding ran out two years ago. Now, another solicitor has managed to secure £10,000 of legal aid, which will pay for a barrister in London to investigate the case. Becky, aged 31, said: “We’ll be discussing the possibility of lodging a claim. We’ve been told that if we were successful we would receive up to £5 million. “This is not about money for us but about the quality of care Georgia will receive. “It would pay for everything Georgia would need for the rest of her life – all the equipment and medical care. “I believe something went wrong in the hospital and something should be done about it." Stephen and Becky, from Washington, near Sunderland, began dating when they were teenagers in the Air Cadets. Becky claims she tried to tell the nurses there was something wrong but they dismissed her fears as anxiety caused by the loss of her first baby. She begged them to perform a caesarian operation to deliver the child but, she claims, they told her there was nothing to worry about. At 35 weeks – five weeks short of a normal, full-term pregnancy – she had more tests. Becky claims the doctors then realised there were problems and she was admitted for an emergency caesarian. Doctors originally told them Georgia, who weighed 3lbs 11oz, was healthy, although she had suffered a bleed inside her head. Becky said: “She was crying constantly – 24 hours a day. She was really stiff – just like an ironing board. “Her muscles were so tense. I couldn’t even take her out in the pushchair because she would scream all the time. It was very, very difficult. I was at breaking point. “I had my little girl but it wasn’t the little girl I had always wanted. I know that sounds awful but that’s how I really felt.” Stephen, aged 31, said: “I worked in the taxi office on night-shift. It was hard on Becky. I would have Georgia during the day and let Becky try to get some sleep.” At the age of six months, Georgia was diagnosed as suffering from cerebral palsy. The condition, which affects one in 500 children, is usually caused by the brain being starved of oxygen in the womb or during birth. While Georgia’s symptoms were relieved by medicine, she still needed 24-hour care. Stephen was forced to give up his job and the couple had to survive off benefits. The stress proved too much for the couple, who had married at Sunderland Register Office just four months after Georgia was born. They had furious arguments caused by the fact they were both stuck at home having to look after Georgia and unable to afford any holidays or even a night out. When Georgia was one year old, Stephen and Becky split. After yet another row, Becky told Stephen to leave. One year later, they divorced. Becky said: “It was a very hostile divorce. We grew to hate each other." Stephen and Becky’s story is just one of a wide range of human interest features Nigel has written for women’s magazines. The photographs of the family were taken by Dave Webb.